The most common form of root rot is caused by the soil-inhabiting water mold fungus Phytophthora. 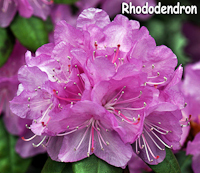 Many species are susceptible to this disease and in the home landscape, the most commonly bothered plants include azalea, rhododendron, Pieris, yews, mountain laurel, heather, and high-bush blueberries. This disease is promoted by high soil moisture content and warm soils so the real problem is often poor drainage. Root rot is very unusual in well-drained soils such as sand and is very common in those high in clay content. Over-watering, unusually heavy rain seasons and hard pan soils may all contribute to the development of root rot. When the roots rot away, it inhibits the plant's ability to take in water so, the result is wilt on the leaves and twigs above ground. 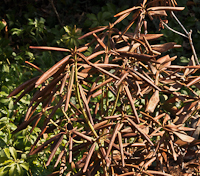 Infected roots turn reddish-brown, become brittle and die.